We hear this all of the time. Don’t you need to have $100k saved up before you can start investing in real estate? The simple answer is, well, “no.” The fact of the matter is that my wife and I were both teachers when we started this journey, and as we all know, teachers aren’t exactly huge wage earners. So- how on earth does someone with a teacher’s salary acquire multiple rental properties? 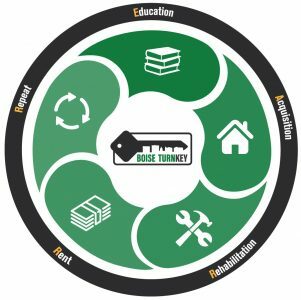 We know exactly how- we have first hand experience and a big part of what Boise Turnkey offers our clients is that experience. We don’t just talk the talk, and as a matter of fact, we don’t charge a penny to show others how to replicate this process. It’s not complicated, after all, we are just lowly teachers! We could head down a rabbit hole and discuss any number of ways to invest in real estate without cash, but there are a couple very simple and straightforward ways to get the ball rolling. You’ll hear real estate investment gurus and people selling investment courses about all of the ways you can invest with “little or no money down,” which is a bit disingenuous. Can you buy a property with no money down? Sure, it’s possible, but it’s not easy. Can you purchase a rental property without using any of your own cash? Absolutely, and most of the people reading this article already have the means to do so. In this article, we will discuss how no money down deals work and one of the simple ways you can purchase a property with none of your own cash. None of your own cash: If you own your own home now, it’s likely you could buy a rental property with none of your own money. Many investors use HELOCs (Home Equity Lines of Credit) to leverage the equity they have in to a down payment on an investment property. HELOCs are cheap, flexible funding that allow homeowners to move their equity from their personal home to an investment property that produces income, essentially doubles their equity growth and reduces their tax liability. Boise TurnKey has assisted many novice investors (several teachers included) in making great use of this strategy and putting the equity in their home to work for them instead of either sitting untapped or buying them a vacation or hot tub. In short- if you have some equity in your home, it’s possible that you could transfer that equity in to a rental property. That rental property would produce monthly income for you, the equity would grow tax free, AND reduce your tax liability. That means that come April 15th, it is much more likely that you’d be cashing a check rather than writing one. This about this- a rental property produces monthly income, increases in value over time and gets you a hefty tax deduction. And if you are using this method to acquire a rental, that can cost you literally not one red cent. The best benefit of all? The above method can be repeated over and over. No money down acquisitions: Another term often used for these types of deals is “owner finance” or “owner carry.” This simple means that instead of using a bank, you make payments to the party that owns the property. Think of it like buying a car from a neighbor- they give you the car today, you make monthly payments for a couple years while you drive the car around. Real estate transactions can work the same way, the kicker is you have to find someone with a problem you can solve through this method, which is where the real work starts. In almost any case, a seller will make more money through a traditional sale than they will through an owner finance deal, so you need to find creative win-win solutions for a seller’s specific scenario. In a seller finance situation, if the seller has no time, it’s likely that a buyer can solve that problem. Maybe they are going to be foreclosed on in two weeks and lose their home and all of their equity. That is simply not enough time to sell a house on the open market. A buyer could come in and purchase that property at a discount by bringing the mortgage current and assuming payments on the mortgage in exchange for the owner transferring the deed to them. Boise TurnKey never advocates for taking advantage of a seller’s situation, but deals can be struck that benefit all. As a buyer, you can offer enough cash and assistance to the seller for them to get back on their feet; find a place to rent, avoid foreclosure, bankruptcy and homelessness. A fresh start. One of the best things about this method is, due to the fact that you aren’t including a bank, which is heavily regulated, nearly any terms you can imagine are on the table, you don’t have to think inside the conventional mortgage box. There are many other ways to invest and leverage, these are just two ways to get your portfolio started when you don’t have a stockpile of cash, like nearly everyone else! Contact us for a free consultation if you are interested in learning more about the strategies mentioned above or anything related to residential real estate investing.